Archive – The Muriel Matters Society Inc.
produced by The Society over the years! Muriel Matters on the Big Screen! The story of Muriel Matters was dramatized in a production made with help from our friends at Rivet Pictures. Starring Brooke Satchwell as Muriel Matters the world premiere took place at the 2013 Adelaide Film Festival. 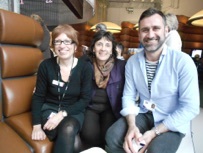 There were two screenings, the first was on Sunday 13 October at 2.15pm and the second was on Friday 18 October at 5pm. Both screenings were held at the Palace Nova Cinema in the Adelaide CBD and bookings were made online through the Adelaide Film Festival’s website. The news about Muriel Matters and votes for women was spread far and wide. Society members met at Cafe Brunelli on Rundle Street on Sunday 13 October at 12 noon for a coffee and cake before they marched to the Palace Nova in time for the debut screening. Homage was paid to the original suffragists as marchers wore items of clothing with the suffrage colours of purple, white, gold and green on them. The Muriel Matters production was screened to a national television audience on ABC1 on Tuesday 15 October 2013 at 10pm via the public broadcaster’s Artscape program. To commemorate the release of ‘Muriel Matters!’ the Society commissioned some documentary related ephemera for sale to the general public. Two handkerchiefs were available. The first celebrated the world premiere screening at the Adelaide Film Festival while the second recognised Muriel Matters’ achievement as the leading protagonist in the first ever aeronautical protest over London in February 1909. Gift soaps were made available and a portion of the proceeds went towards The Seeds of Affinity, an organisation that offers pathways for newly released female prison inmates. Muriel was a campaigner for prison reform and the Society was delighted to be able to contribute to their work in this small way. The Muriel Matters Society 2013 badge, key ring, pack of assorted cards, balloon flight tea towel and the ‘Why Muriel Matters’ Centenary Play programme were also available for purchase through the Society. All ephemera is of a limited number with all proceeds go directly back into supporting the work of the Muriel Matters Society. 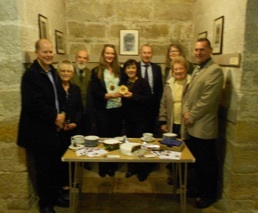 Executive members of the Society, Frances Bedford and Steph Key, were back in England promoting Muriel’s life. The English seaside town of Hastings is where Muriel stood for election in 1924 and later spent her retirement. Click here to read The Hastings and St. Leonards Observer’s article and be sure view the video of Frances and Steph talking about their visit! Frances Bedford visited Hastings in April 2012 and hosted a morning tea for our friends there. Thanks to Barbara for assistance with catering and to everyone for attending. The announcement of the proposal for a second life size memorial statue was well received and work will soon begin on design and fundraising and negotiations with Hastings Council, following the election due there shortly. In London, Frances was well looked after, above and beyond, by Irene (suffrage historian) and David (good all-rounder!). She met with Beverley and Nickos (Museum of London), Elizabeth and Jill (suffrage historians) near one of Muriel’s former homes. 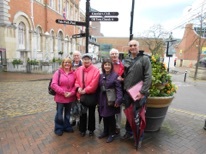 In Aylesbury, Frances accompanied Colin on a Heritage Walk. One of nine in Colin’s book, the two local Peters also made the day enjoyable. Special thanks to everyone for making the trip enjoyable and successful! 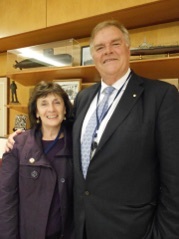 Flying home via the USA, Frances visited Australian Ambassador Kim Beazley and our other friend in Washington, Jeanatte Murry. Funding was secured for a 30 minute feature, focusing on Muriel Matters’ life as an actress elocutionist and how she used her experience in these crafts to make social change. Producers Julia and Claire have begun work and have met with a vary talented director to begin planning. Donations to enable finalisation of this particular project were most welcome at this time. The Society was welcomed by the Governor General, HE Quentin Bryce, to Admiralty House for a morning tea prior to the Sydney launch dinner. We were grateful to the Governor General for her kindness and enthusiasm for all things Muriel. HE Quentin Bryce, Governor General of Australia, welcoming members of the Muriel Matters Society in Sydney. Recent research into Matters’ early life by The Society has revealed connections with Lionel Logue, the speech therapist recently made famous in The King’s Speech. Logue and Matters appear on the same program at The Lyric Club, Adelaide, 1903 and both competed at Royal South Street in Ballarat, where Lionel also adjudicated. In addition, Matters’ brother, Leonard Matters (Member of the British House of Commons 1929-1931) and Logue also travelled to England aboard the same passenger ship. As Matters worked as an elocutionist in Adelaide at the same time as Logue, it is likely the two families were well acquainted. Marie Maddocks of the State Library of South Australia is continuing to follow up these promising leads on behalf of The Society. The Society reluctantly farewelled Muriel’s Chains and Holloway Prison Badge in April. Special thanks to Beverley and Nickos at the Museum of London, without whom the long term loan would not have been possible. Thanks also to the Clerk of the House of Assembly for his continuing full support. The Grill remained on display in Centre Hall and could be viewed by the general public for an extra period of time. The Society is pleased to report that the Centenary Play was an outstanding success. The debut season of ‘Why Muriel Matters’ ran in conjunction with the Adelaide Cabaret Festival and was originally commissioned to commemorate the centenary of Muriel Matters’ lecture tour of Australia in 1910. After premiering at the Adelaide Town Hall, a series of more intimate performances were conducted at La Boheme. The Society is hoping the play will be accessible to more audiences in the future. A successful metropolitan tour went ahead throughout June to Venues in Elizabeth, Marion, Pt Noarlunga, Golden Grove, Angle Park (The Parks Theatre), Hilton (Star Theatre) and Barossa Art Centre, as part of the ‘Out of the Square’ matinee series. In addition, a well attended regional tour travelled in July, through Arts SA, to venues in Clare Valley, Whyalla, Streaky Bay and Pt Lincoln. Keep your eyes out for future touring dates – perhaps as soon as 2013. Thanks to playwright Sheila Duncan and the production team, Lisa Philip-Harbutt from the Community Arts Network and Margie Fischer who have been responsible for making the play happen. Mementos from the Centenary Performance such as, the ‘Why Muriel Matters’ programme, assorted cards (pack of 4) and the enamel centenary badge were made available through The Society. A commemorative handkerchief was also produced. Handkerchiefs were used as an advertising tool in the 1900s and with the help of Mark Thomson, The Society has reproduced this memento to celebrate the Play. The limited edition handkerchiefs were priced at $20 and over time they will definitely become a collector’s item. A commemorative Balloon Tea Towel was also produced and a fashionable silver key ring, featuring The Society’s logo portrait was available. Building on initial work by Frances Bedford, Marie Maddocks and Steven Anderson, The Society continues on various lines of enquiry on each aspect of Muriel Matters Life. Special thanks to Lyn O’Grady for research assistance and finding a way to access the BBC clipping of Muriel’s voice. 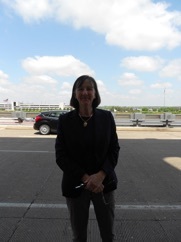 It is wonderful to hear her speak and gives us fresh impetus (not that we needed it!). 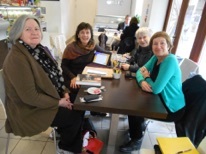 Wendy Herbert is continuing to find wonderful things about Muriel Matters – we now have interviews with Muriel from the Women’s Freedom League’s publication, The Vote, which gives fresh insight into many aspects of her life both here and after her arrival in the UK. © 2009-2019 The Muriel Matters Society Inc.
All website content is copyright of The Muriel Matters Society Inc.